Fylet : Easily and securely download your photos & videos from your phone or tablet to Windows PC from anywhere. Your devices don’t have to be in the same network! 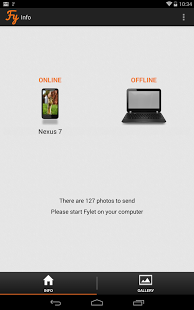 Fylet sends your photos directly to your computer. It is not a cloud-based solution like DropBox for example. You don’t have to worry about cloud privacy threats. Your pictures are stored only on your devices. Forget the USB cable. Automatically back up your device’s photos & videos directly to your computer. There is no clicking and complicated setting to download your images in automatic mode. Fylet automatically backups pictures from your mobile phone to your computer. It is fully automated solution; so photo sharing between devices is totally hassle free. But you are in charge, so you can also manually pick photos to send. Get unlimited number of pics from your smartphone to your PC. There is also no file size limitation when copying images to your computer. So, go! Simplify your photo transfer and uncloud your memories. Use Fylet! Nice one This is what I call automation. Run the app and forget about it. It does all the work for you. Thanks guys! Excellent Best, simple & fast App. Transfers photos to PC in a fly. Need not work around, just sign in, App does the rest. WOW! Easy transfer of pics. Excellent App. Excellent app Easy to use and its working/transferring really fast. Awesome app!! The best app for safely transferring your photos. Great job guys! Excellent Easy to use, convenient. It automatically transfers pics from my phone to PC. Even quicker than Dropbox. Love it.